(Andy Barron/The Reno Gazette-Journal via AP, File) In this Aug. 31, 2013 file photo, the "Man" burns on the Black Rock Desert at Burning Man near Gerlach, Nev. The San Francisco-based Burning Man organization is opening a year-round, satellite office in Reno to better support operations in the northern Nevada desert that hosts the annual counterculture festival. Reno, Nev. • The San Francisco-based Burning Man organization is opening a year-round, satellite office in Reno to better support operations in the northern Nevada desert that hosts the annual counterculture festival. The Reno Gazette Journal first reported this week Burning Man will begin a three-year lease later this year at the old downtown Post Office built on the banks of the Truckee River in 1933. "We're enthusiastic about this new year-round office and look forward to deepening our longstanding ties to the Biggest Little City," the Burning Man Journal said in a post on its web site on Monday. The organization's headquarters will remain in San Francisco with more than 100 full-time employees. Reno's 2,800-square-foot (260-square meter) office will employ fewer than 20 employees transplanted from headquarters. "Burning Man's relationship with Reno goes back nearly 30 years and we're inspired by the ways Reno has embraced Burning Man art and culture," the post said. Sculptures featured at the festival in the Black Rock Desert 120 miles (193 kilometers) north of Reno have made their way into several Nevada communities, including Las Vegas. But downtown Reno is home to the most. The Post Office is across the street from Reno's City Plaza, home to the Space Whale and Believe sculpture from Burning Man 2017. In 2017, Washoe County was awarded a $75,000 National Endowment for the Arts grant and is partnering with the Burning Man organization to build a 200-mile (321-kilometer) art trail from Reno to Gerlach. "We're very libertarian in spirit, we're very open-minded. It's a great mix of Burning Man and other, local arts organizations," said Alexis Hill of Reno's burgeoning arts scene. 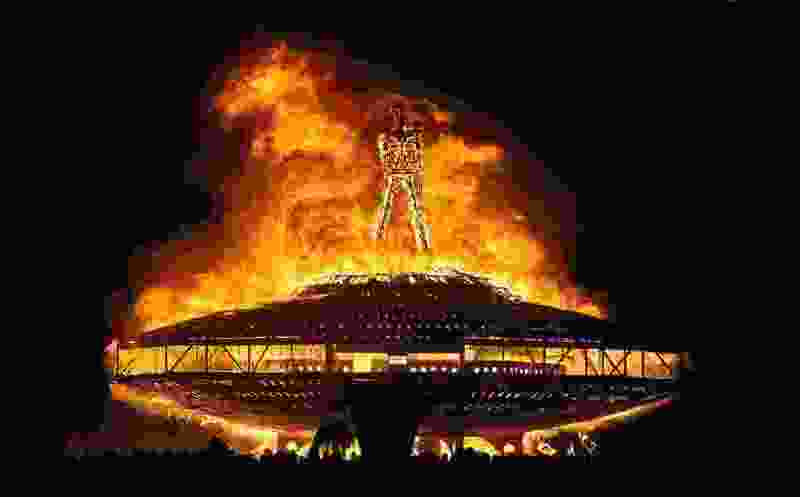 “In many ways it’s a home for us,” Burning Man spokeswoman Megan Miller said.